The Grants lived in 13 ward as we did. I think it was the first Primary Conference that I remember going to, I was 5 years old. People used their rags to make carpets of but they needed them just then for paper badly so people supplied them liberally. At that time, we would get such books as the Faith promoting series. They were stories of marvelous blessings & preserving care of our Father in Heaven to his obedient children. I remember Bishop Nelson A. Empies when we were back in the 13 ward again his beautiful daughter with her long blond braids of hair. I remember taking our basket of fast donation as we went to fast meeting to Bishop Wooley, later. One time President Grant's mother invited the girls of the Primary to go to sew carpet rags one afternoon for her, she was a beautiful woman. We got new thimbles for the occasion. As we went that afternoon, I remember those women who were the leaders of that day, Eliza R Snow, Bathsheba Smith, Emiline B. Wells & Zina DH Young, the Apostles & seeing Brigham Young before he died & how sunken President John Taylor's eyes were. Leah Dunford used to come to our house to play & we would go to hers. She had such wonderful playthings. She is now Apostle Widsoe's wife. She was a very fine little girl so I know she is a fine woman. & seeing Brigham Young's grave. Moody & Sanky were not Mormons but men trying to get people to be good. John McDonald, a half brother of Aggie's who wore long hair had cut it off when it was needed for a lady to wear in a play. He is the father of the man who started the famous McDonald Candy & Chocolates in Salt Lake City. We got our groceries from this McDonald's store. 19 We girls, Aggie, my sister Lizzie & I went through & past the Eagle Gate to Brigham Young's school house one winter. I remember seeing & hearing William C Dunbar play his Bagpipes, & going to hear Preachers Moody & Sanky in the Tabernacle. One winter we went to school in the Old Social Hall across the street & up the hill from the Old Playhouse Theater. At recess we used to walk along its water shed. It was quite high but we could keep our balance for a while by putting one hand on the wall for balance. I remember the first play I went to in it, the Grand Duchess. I saw the Mosiah & other plays there. When Evan Stephens was taking students from all the wards & teaching them music my sisters & I were chosen for students. He taught them free then gave concerts to met expenses. We were in one in the theater before we moved. We passed the theater every time we went to town & back. I loved to run up the steps on one side & down the other, these were steps on 3 sides in front. In 1877 I was 5 years old, I remember seeing Brigham Young on the street walking with his cane & seeing Daniel H Wells & all the Apostles of that day quite often. George Goddard lived in our ward, he loved to sing Who's on the Lords Side Who. His son led the Singing in S. School. We had to pass the beautiful house & grounds of Feremorz Lettle, he baptized me. Horis L Eldridge lived across the street, they had such a lovely home, had Shetland ponies & a Cart. Our home in the 13th Ward was one of the central wards. The wards in the S.L.City Stake had Primary Fairs, the children doing their nicest work to exhibit. Georgia Spencer, our President, took Aggie, myself & 4 other girls & taught them, us to draw & paint flowers. We enjoyed it so much & being at her lovely home. She was such a sweet woman but there wasn't a fair before we moved away. Alice Merrell & Mamie Carns were my S. School teachers. Allie Burt was a very dear friend. One of our greatest joys was to go to Grandfather Chapman's place & visit with Grandma, Aunt Ann, Aunt Catherine & play with their children. They lived in a different ward & a number of those long blocks east of us. Grandma had slipped on the ice that was around the outdoor water tap & broken her hip about a year before we left. We used to go to see her when she was in bed at Aunt Catherine's, later they moved her to the L.D.S. Hospital just across the block east of their home. When we visited her she would tell us stories & sing to us, the first time I heard Old Dog Tray & Paddle Your Own Canoe. She was in bed 3 years with that broken hip before she died. Grandfather Chapman had cut stone for all the other Temples & Brigham Young always knew what people could do 21 southern Utah, he was president of the Stake. James Richey was one of his Councilors. When the stone for the S.L. Temple was ready to cut, Grandfather was called to S.L. City to cut stone for it. He & his oldest son Joseph were stone masons, all there were was needed. Brigham Young called all who could to cut stone. Uncle Hyrum & father also were stone masons & cut stone for the Temple, but not as regular or steady as Grandfather & Uncle Joseph, When the Temple was to the square & no more stone to be cut grandfather moved back to Manti. It was there Grandmother died. Our Father loved his brother Joseph & when we lived in S.L. City, we often went to Uncle Joseph's. He was quite deaf, hadn't married until quite late in life & his children were about our age, Don Carlos, Josephine & John. Aunt Jane had been married before & had 2 sons Fred & Ernest Tullage, very nice boys. Their father was a drunkard so Aunt Jane & her boys appreciated Uncle Joseph for he was a good kind man. He & Father often played checkers together. Uncle Joseph never made a sound but Father would whistle all the time all through the game. I had meny dolls. When I had to have my first teeth pulled I had to go to a dentist they had such long roots I dreaded it so bad that the doll would be given to comfort me I had toothache so much of the time Aunt Rozellie & I had many visits when I went back to conference to S.L. City & visit my Sister Lizzie 23 wax faces & nice hair, the biggest ones we had ever had. I was 12 years old & enjoyed making clothes for them. It was the last time I saw Grandma but I had many good visits years later with Aunt Rozelie. She could tell me so much about their lives that I was glad to hear, Uncle Hyrum Lord was a very fine man. They had 2 children live to be grown that I knew & loved, Dan & Ada, & all of my relatives, I loved the relatives I ever saw. The last Christmas in SL City was such a happy one, it was the best one I remember, (for our dear momma was buried the day before the next one in St Johns). We lived so near, our tree was in Aggies Grandma's upstair parlor & how it was loaded with lovely things & we enjoyed it so much. Before it had to be taken down, on New Year Day we put a big 1884 up on the top of it. Little did we think it would be our last time together in the City or State, for in the spring in 1884 when they were having so much trouble between Mormons & Mexicans in St Johns, Ariz. the Church called for volunteers to go to settle & help the Mormons. Bro. Tenney was trying to make Peace. Bro. Tenney had been killed & they were trying to drive the Mormons out. I think there were white men into it for they were having land trouble too, & we were told it would be a second Carthage to this people if it wasn't settled. There were so many outsiders in the vicinity & Snowflake country too, taking part with the Mexicans. If there were not enough volunteers they called more. My father volunteered from the 13th ward in April & the ward furnished him a team of mules & wagon to go in. I do not know if they gave more but I think they did, some of our things were shipped by railroad. We girls slept in one end of the wagon box (back), our parents in the front end so we didn't have to make our beds on the ground. Aggie came with us. I knit a pair of brown cotton stockings on the road there were days we had trouble traveling in the mountains where there was high water & mud. The first night out we camped at the point of the mountain south of the City. It was wonderful to me. Near where we camped father told us the people had a young deer in the barn. It was my first to see, they are beautiful. I did not realize the heartaches my Mother & Father had leaving their people. It was all very new & thrilling to me, I know now that it is the ones left behind who suffer most. There are so many new things to take the mind off the travelers sorrow at parting, but I longed so much to see the dear ones & places for many years after. to keep from getting Cactus slivers that fester & make such nasty sores that children shouldn't handle them. When we could we got milk as we camped near ranches one time the cows had eaten wild onion or garlic the milk couldnt be eaten. 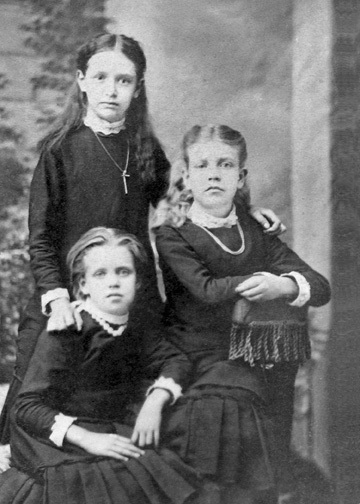 the Gorge & Garlie sisters sang so beautifully together & often sang evenings around camp fires. Water was high from snows when we got to the Sevier river we had trouble crossing it & they had to several times, one day mud was so bad the company only got across it & 5 miles on our way that day by doubling teams laying brush in the mud & other ways we got along, one bad place our mules balked we girls cried when father had to beat them & he told us to go on down the road, he always got out & walked up hill to lighten the load & if it was a steep pull he had us get out & walk he was always kind to his animals thats why we girls cried when he had to beat the mules in watering them one time he told us to go in a certain direction to see Cactus blossoms & at times we saw them along the road. It was the first we ever saw, they were so lovely. As we got in the wagon to leave S.L. City the cat jumped up in the wagon & we took it. It amused us girls on the road. We went through Kanab & one noon we stopped at Johnson, there was such a pretty spring coming out of a high rock. At the foot of it was a place that held the water & pretty flowers moss & plants growing at the edge of the water. About this time I had a dream, that as I stood on the shore of Salt Lake where we used to go, the ground kept caving away around me. I was in great danger when Moroni came & took me away I was so thankful for his help it wasnt long before we were engaged. Moroni, in 1888, was 39. I was 16 when married after we were married & visited in St.George we went to Washington the Richey's old home & got some things they had left with their Aunt Jane they brought a five gallon can of honey & got provisions for our home trip we were 5 weeks going & coming home. 35 to Arizona, the old friends had parties for us, Wednesday the 12th of September 1888 Moroni & I were married for Time & Eternity in the St. George Temple he was so kind & considerate of me & how very thankful I was for I was so young & no mother to tell me what married life & raising a family was like but Mother Richey was a lovely mother to me I hope I have been as good to my sons wives as she was to me. She helped me in every way, Moroni had his homestead house & furniture ready for us on his side of the river where the springs were the others got their water from the ditch that was taken from the river to water the farm land	we lived at the farm it was called Walnut Grove then there was a grove of Walnut trees in the upper or South end of the Valey & a few trees of them on Moroni's part of the farm he had homesteaded the west side of the little Colorado River Benjaman Homesteaded the east side of the river the West side had Springs all along the hillside below the mesa of Volanic Rock that ran along the length of the place the Springs made the hillside green.